Zigg: I really like the pose here, with the trio looking like they’re bursting out of the screen right at you. 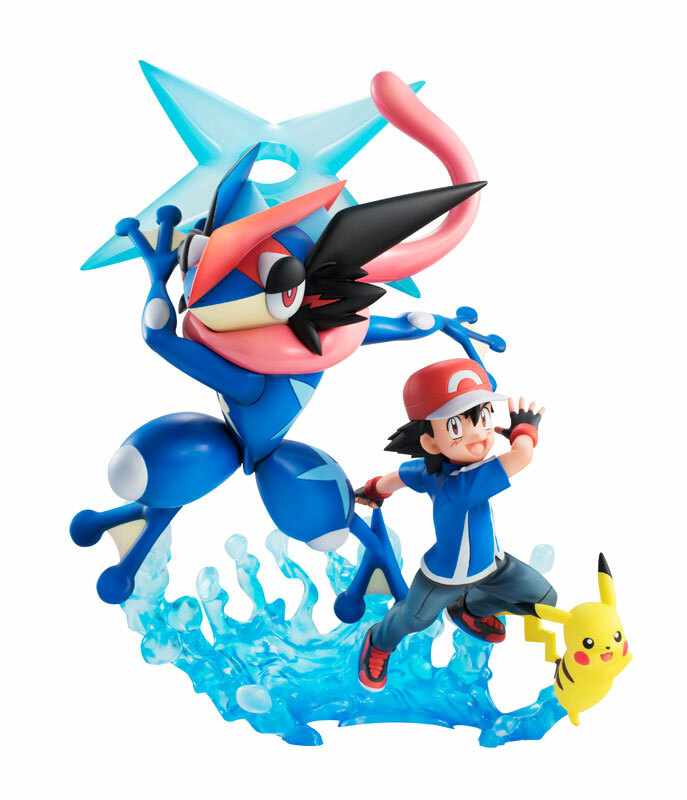 Value wise this is probably one of the better bets from the Megahouse Pokemon range too, since it’s pretty big (height 170mm) and yet reasonably priced. Despite picking it as my X starter I’ve never been super huge on Greninja but it’s tough to deny the quality of the piece. Iro: There’s pretty good value here for getting three characters, but I suppose that depends on how much you care about Ash’s super special snowflake Greninja with which he shares a singular unbreakable bond that transcends the relationship between human and Pokemo- wait, he left it behind like all the rest? Huh. Jel: Wait, is Greninja really that big??? That’s terrifying! I thought he was just a frog or something. ANYWAY, this is a pretty great looking figure with fantastic action pose and technically you’re getting three characters for the price of one. Seems like a good deal to me. Zigg: I really like this. 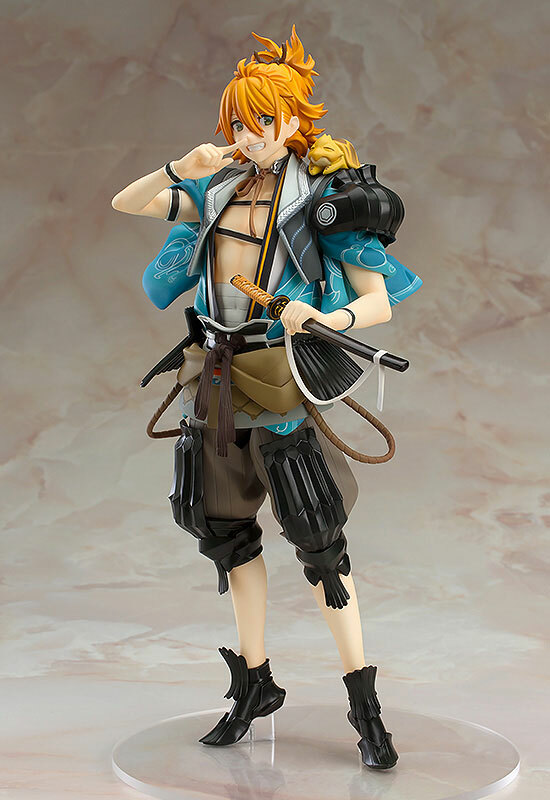 Compared to all the other Touken Ranbu figures we’ve had, which tend to be dour, creepy, or a mixture of both, this is a breath of fresh air. I’m loving the strong contrast between the blonde hair and blue outfit, and GSC’s detail game is as on point as ever. The cocky grin really seals this as a piece with a lot of character. 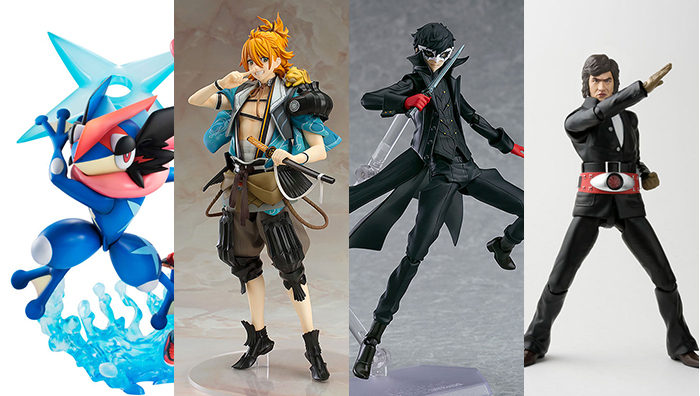 I suppose I should stop being surprised by the crazy prices that are increasingly the norm, but it’s still tough to swallow ¥14k for a small-scale figure like this. Iro: This sure looks like it came out of a mobile game, with the Shinsengumi cloak and otherwise mostly normal samurai-type clothes covered with bizarro anime armor bits that don’t actually even offer much protection. The color contrast stands out pretty well though, and I like the goofy animal on the shoulder. Seems decent enough. Jel:I think the most notable thing about this figure is the color choice. The orange hair and blue shirt or whatever you call that make for a really striking contrast. It certainly stands out compared to other Touken Ranbu designs as well, which usually skew toward very traditional dark-haired Japanese styles. Seems like it’s maybe a bit on the expensive side, but a real nice looking figure regardless. 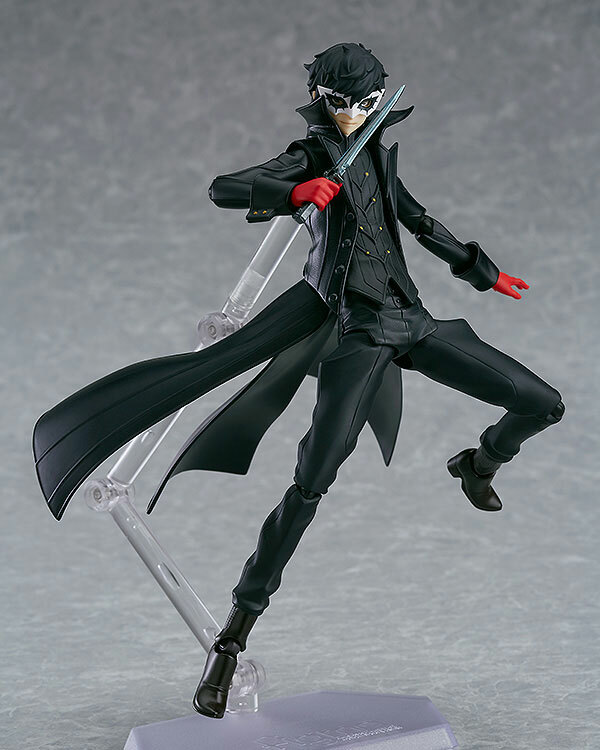 Zigg: While Joker’s design is incredible, I don’t think that it translates particularly well into plastic and PVC, with the black on black on black colour scheme in particular losing something in the translation. That, and a lack of inspired acessories make this difficult to recommend, especially at the grossly over-inflated standard figma price. Iro: Whoa, looking cool Joker! Gags aside, this looks solid, albeit a tad uninspired. Morgana is about the only thing that lifts this higher than “expected in every single way”. Jel: Joker has the advantage over his other Persona main character counterparts in that he actually has a visually interesting outfit aside from his normal school uniform. That said, it’s still a bit too much black to be really striking. I do like the coat and Morgana is nice addition so overall I’d say this is a win, even if I would personally rather spend my money on the amazing Morgana nendoroid. Zigg: The idea is great but making good transformers is hard, and as a result I feel like this figure is only a partial success. 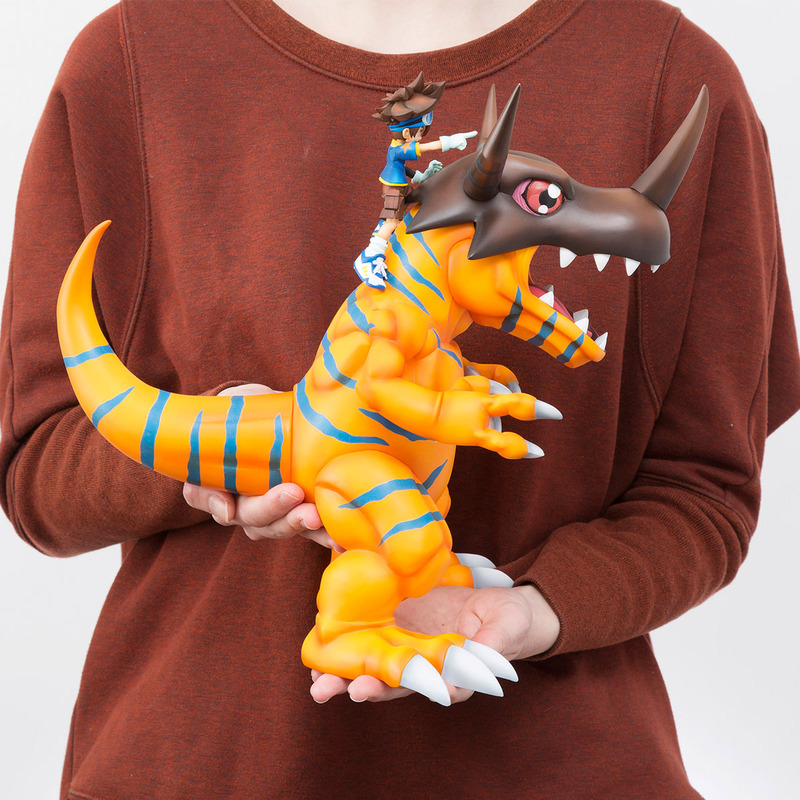 MetalGarurumon looks fabulous, no complaints there, but Gabumon only really holds up when you look at him directly from the front, otherwise all the kibble is totally out in the open. As cool as the whole thing is I probably would have taken a (cheaper) non-transforming figure of just MetalGarurumon and been happy. Iro: I do believe this is a reprint/remold of a toy from my childhood (Zigg’s note – No, it’s a new mould around the same basic idea), but I’m pretty sure it wasn’t $75 back then. 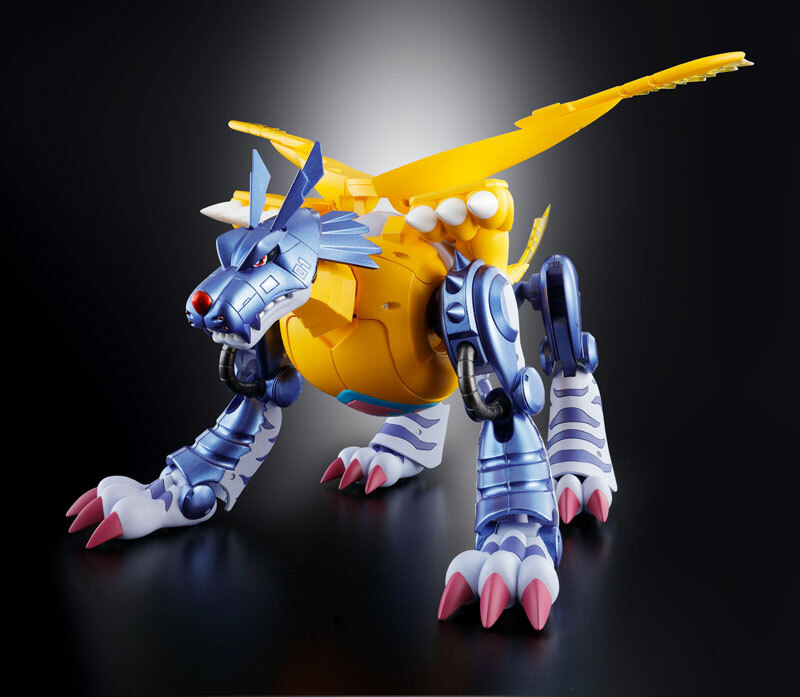 MetalGarurumon is one of the classic Digimon examples of “higher evolutionary levels turn into robots and get guns“, and Gabumon is second only to Agumon’s family for mass recognition. If this weren’t so atrociously expensive, I might actually consider it. Jel: I know nothing about Digimon and therefore don’t have much to say on this aside from “hey, that’s a cool robot tiger thing” or whatever it is. I guess from a technical point of view the transformer thing is cool and they did a decent job of hiding all the extra bits – well, except maybe those dinosaur feet on his back. Zigg: The very epitome of unshakeable 70’s cool, complete with immaculately flared plastic trousers. Yeah, the price is a bit steep for what you’re getting but it;’s such a charming, niche little product it’s hard not to give this a thumbs up. Iro: I suppose this was inevitable after the Space Sheriff Gavan one, huh? I’m more surprised this wasn’t first. 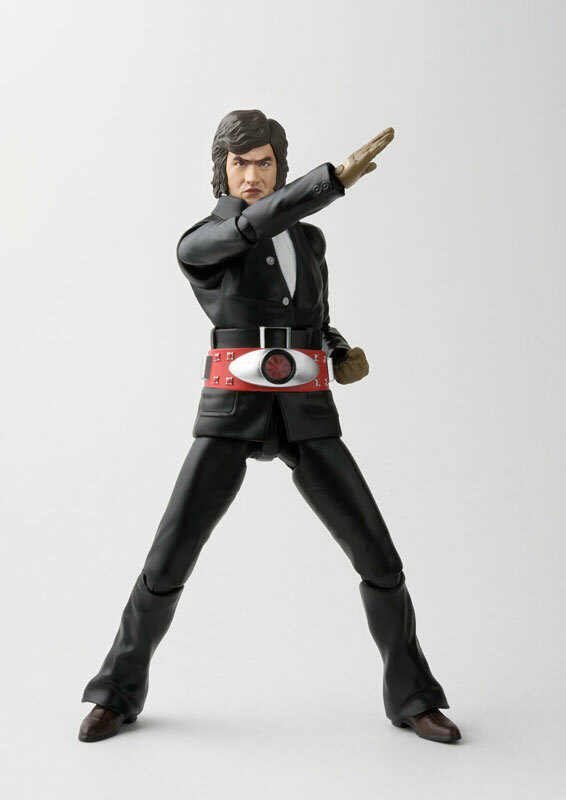 And, uh, since they could theoretically just re-use the head mold, when’s the Segata Sanshiro figure? Jel: For some reason I find these “real” figures more amusing than when they have the full costume on. More importantly, is this the closest we’ll ever get to a Segata Sanshiro figure? Zigg: It’s impressive in terms of sheer scale I guess, but the awkward pose and weird facial expression don’t exactly fill me with confidence, and the fact that it’s so tall and thin makes it far less of an imposing display piece than something of this mass probably should be. 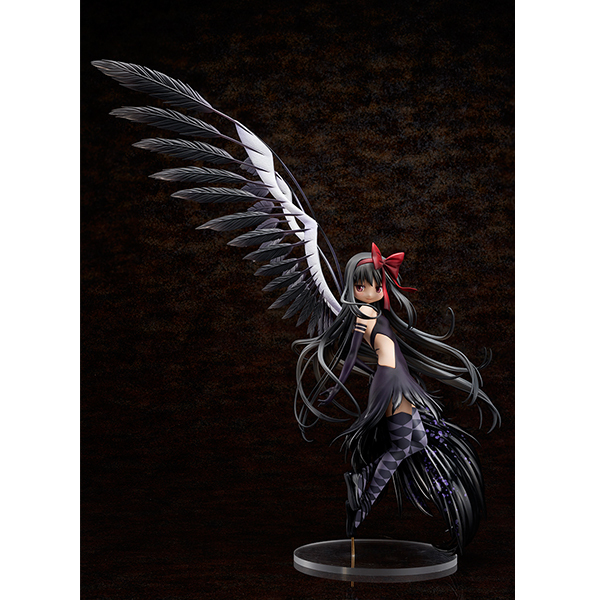 Aniplex also already made a much more impressive version of Homura a few years back, though I guess the franchise is such a money spinner a repeat isn’t the worst thing in the world. Still, tough to get excited about. Iro: Wow, the closer I look at this thing the worse it gets. Her expression is particularly off-putting, making it look like she put on fetish cosplay for the viewer’s benefit or something. Plus, I heard the movie wasn’t very good; I’ll give it props for technical artistry on the giant wings but that’s it. Jel:Oh, are they still making Madoka figures? I guess this looks OK if only for the ridiculous visual proportions from the wings, but ultimately it’s just reminding me that the Madoka movie series happened and I wish they didn’t.